The number of illegal aliens captured at the southern border has overloaded the facilities that hold them, and thousands have been released into the country. 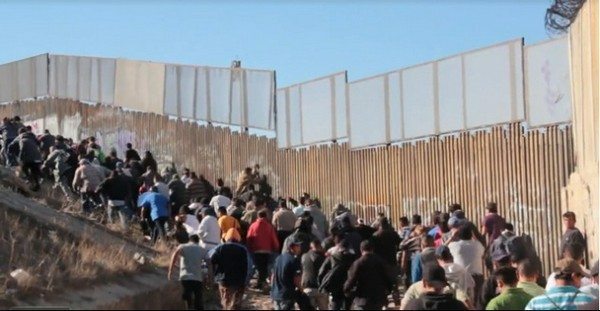 Illegal entry has been routinely called a non-crisis by much of the media and Congressional Democrats, and recently Jeh Johnson, Secretary of the Department of Homeland Security under President Barack Obama, called it that. Appearing on CBS last month, Johnson said: "So here are the facts: the facts are that illegal migration on our southern border is a fraction of what it used to be." He added, "But a security crisis per se? No. I would not characterize it that way. I think there is some fear-mongering going on." Perhaps Congress will finally get the message. Had Congress taken administration warnings seriously and acted to relieve the situation months ago, this crisis could have been resolved. Cuellar said, after speaking to Customs and Border Patrol agents, he had discovered a disturbing trend of adults “renting” children in Central America in order to increase their chances of being able to stay in the U.S. once they cross over. Chris Farrell of Judicial Watch visited Guatemala earlier this year to get a first-hand look at the first of several caravans headed toward our southern border. This effort, he estimated, cost several millions of dollars for food, water, transportation, medical equipment, mobile hospitals and child services, which reminded Farrell of a complex military operation. And while they did walk portions of the tremendous distance through Mexico, they primarily traveled on chartered tour buses, dozens of them. And then, Farrell asked the obvious question: “Well, if things are so bad, why did you leave your family back home? Of course, they couldn’t answer that question,” he said. Perhaps the growing recognition of the crisis at the southern border will bring a realistic attitude about the nature of the numerous migrant caravans headed our way and get Congress to do its job, and take action to address this crisis. President Donald Trump has threatened to completely shut down the border this week if Mexico doesn’t take steps to stop the caravans from traveling through to the border. He has already cut funding to El Salvador, Guatemala and Honduras because they have not taken action to halt the flow of migrants. Shutting down the border has some serious problems for Mexico and the U.S., so Congress must act quickly. Texas Attorney General Ken Paxton said yesterday on Fox News’ “America’s Newsroom” that his state cannot deal with the number of illegals entering it, and the same situation exists for other border states. That does not, however, preclude a block by an activist liberal judge.